The Inn is perched high on a hill overlooking the village, giving us beautiful distant ocean views. We have chosen custom toiletries that are bottled special for our Inn, and in each bathroom we offer shampoo, lotion, conditioner, hand soap, and body soap. All rooms have a Keurig coffee makers with an offering of assorted complimentary k cups, creamers and sweeteners. In each room we also provide a small refrigerator with complimentary bottled water, as part of our green policy this is your bottle for your stay and you can refill it from our Poland Springs dispenser in the common area. All rooms have bureaus or storage drawers in platform beds as well as places to hang items. Each room also has a welcome book with information about town and our Inn, and a menu guide to a majority of the restaurants in town. Daily housekeeping is provided each day, if our guests wish to have the room cleaned, if not, a sign is available in the room to hang on the door. 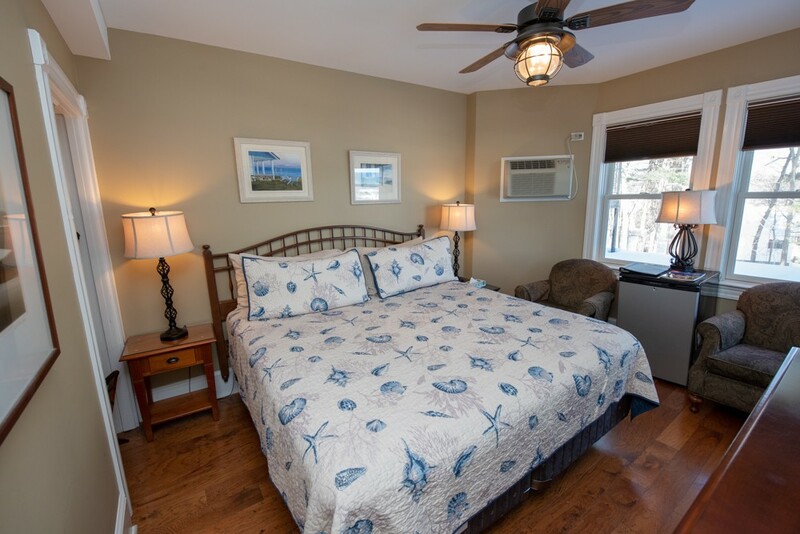 All rooms have individually controlled AC and heat. 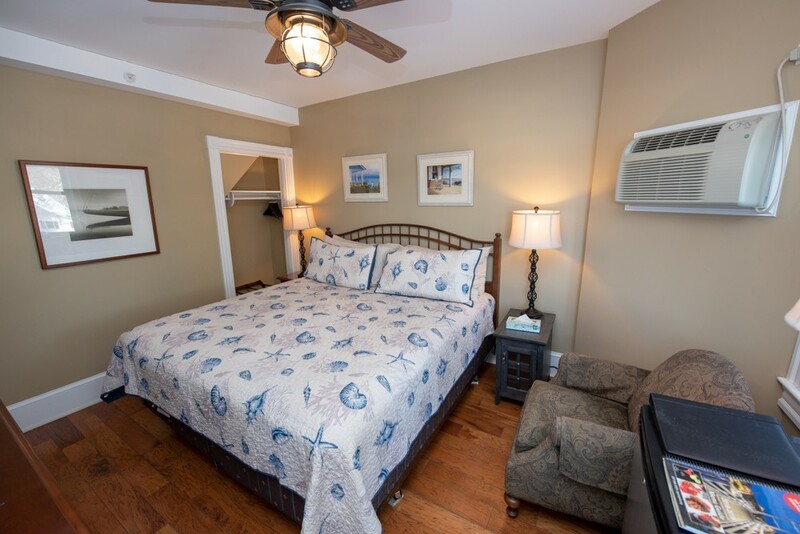 All rooms have a TV with Digital Cable and the ability to play a DVD. We have an extensive movie collection to choose from. There is a full flight of stairs from the parking area to get to the first floor. King 4 is on the second floor 1 flight of stairs. 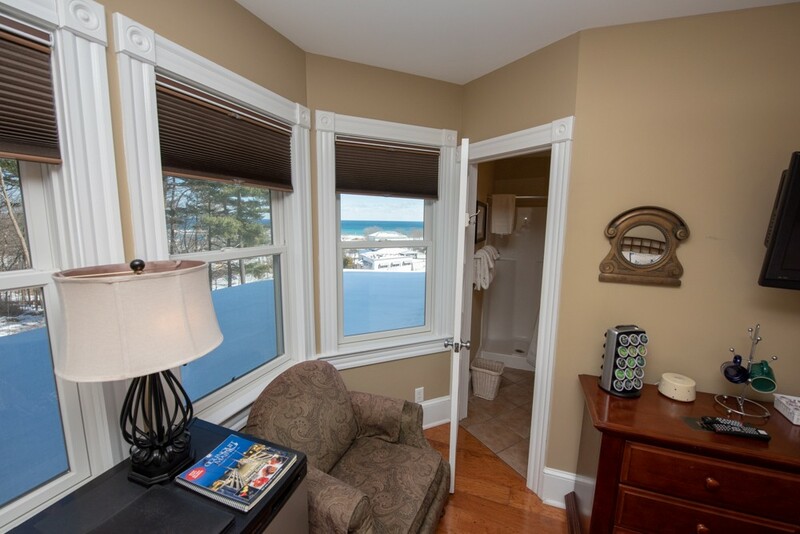 King 4 has a nice large bay window, and faces North towards the woods, but also you can see the ocean to the East, not a direct ocean view, from both the bed and the 2 chairs in the room. King 4 has an in room bathroom, but is on the smaller side, something to keep in mind when booking for taller people. This room has hardwood floors. Nice new hardwood floors have been added to this room.